Whenever travelers think of going for gorilla tours in Uganda, Bwindi impenetrable forest National Park is the first place that comes to mind. Many do not know that besides Bwindi, gorilla trekking in Uganda can be done in Mgahinga National Park. Mgahinga National Park neighbors Bwindi and is also located in the South Western part of Uganda. The Park is relatively small measuring an area of 33 sq km and is located in a mountainous area bordering Rwanda and the Democratic Republic of Congo (DR Congo). Unlike Bwindi Impenetrable Forest, Mgahinga is an extension of the greater Virunga conservation region which also includes the Volcanoes National Park in Rwanda and the Virunga National Park of the DR Congo. The forests provide shelter and sufficient food for the mountain gorillas and other park animals. It is much easier and faster to reach the park by road coming from Kigali in Rwanda. The route from Kampala or Entebbe in Uganda can take up to 8 hours by road. Gorilla Trekking in Mgahinga first came to prominence in 1991 when it was set apart to protect the massive apes. But even before then, the park was famous for its beautiful scenery prominently painted by three beautiful volcanoes - Gahinga, Sabinyo and Muhavura. Several forest creatures, birds and primates like the endangered golden monkeys had always called the park home. About 80 mountain gorillas live in Mgahinga National Park of which only one group is fully habituated and open to tourists. Why is Mgahinga less known compared to Bwindi? One main reason is the sheer size of Bwindi impenetrable forest which is not only a UNESCO world heritage site for its biodiversity but houses 45% of the remaining population of mountain gorillas. These reasons alone attract thousands of tourists to the park each year. Despite Bwindi’s obvious advantages, there are those who still root for Mgahinga as the better place for gorilla safaris in Uganda. They have strong arguments in support of Mgahinga as we shall soon see. Mgahinga may be less known and visited but has arguably one of the largest habituated gorilla groups in East and Central Africa - The Nyakagezi group. This group is also known to have the largest number of Silverbacks in Uganda and elsewhere. The Uganda Wildlife Authority sells only eight permits to eight visitors each day at a cost of $600 per unit like in Bwindi. Locating the one habituated gorilla group during trekking is much easier than most of the groups in Bwindi because they live in a smaller and known feeding range. Mgahinga is not only famous for gorilla trekking. The fewer visitors to the park allows more room and private time to simply relax and enjoy what mother nature has to offer within the park - Buffaloes, bush hogs, golden cats, Colobus Monkeys, leopards, porcupines, tortoise, bushbuck and many more. Visitors can take part in several other activities like mountain climbing, cave explorations, nature walks, birdwatching, the Batwa Trail and tracking golden monkeys. Climbing up the summit of Mount Gahinga, Mount Sabinyo and Mount Muhavura provides opportunities to witness great landscapes of the vast Virunga ranges which include the areas around Rwanda and DR Congo. The Nature Walks can be done on the mountain slopes, along Lake Mutanda, the forests, swamps and human plantations surrounding the park. While on these nature walks, visitors should expect to spot a variety of birds, the beautiful nature, smaller primates and the locals living around the park going about with their daily life. Regarding golden monkeys, Mgahinga is the only national park in Uganda where visitors can spot the beautiful but endangered primates. Golden monkeys are subspecies of the blue monkey and attract tourist because of their endangered status, cute looks, curiosity and stubborn nature. Just like the mountain gorillas, golden monkeys are only found within the Virunga ranges in Uganda, Rwanda and Congo. They love swinging on tree tops but can be seen eating foliage on the ground and occasionally in human gardens if they can. Including both gorilla trekking and golden monkey tracking in a tour package makes for a thrilling adventure for primate lovers going to Mgahinga. For visitors interested in visiting the Batwa Pygmies and learning about their culture, Mgahinga is the best place to go. The Bata Trail in Mgahinga is a different and much more enriching experience than the Batwa visit in Bwindi. This is mainly because the activity is long, carried out within the forest and led by Batwa guides. Who are the Batwa? The Batwa were the original inhabitants of the forests of Bwindi and Mgahinga for thousands of years before the Uganda government decided to remove them from the park and allocate them land near neighboring communities. The idea was that by assigning them a new settlement, more room for the gorillas and other wild creatures would be created in the park. The gorillas won this one but unfortunately the Batwa have never fully adjusted to life outside their former home despite great effort by the government and international organizations to help. The fast changing modern life and persecution from neighboring tribes have left the Batwa marginalized and living in extreme poverty among. During the Batwa Trail in Mgahinga, visitors get to learn about their former way of life - How they used to sing, dance, gather fruit/food, collect honey and make fire. One comes back from the tour happy to see the gorillas and other animals but with a feeling of sadness on learning about the challenges faced by the Batwa in adapting from food gatherers and hunters to farmers. Related to the Batwa Trail, another prominent activity in Mgahinga worth mentioning is cave exploration at the foot of Mount Muhavura and Garama. The Garama caves where formed millions of years ago and provided a perfect shelter for the Batwa community and especially their Kings. They could use these deep caves as a gathering and meeting points during their numerous wars with their Bantu neighbors. The bat-filled caves can be explored using strong torches to maneuver through the trenches that go up to Rwanda. 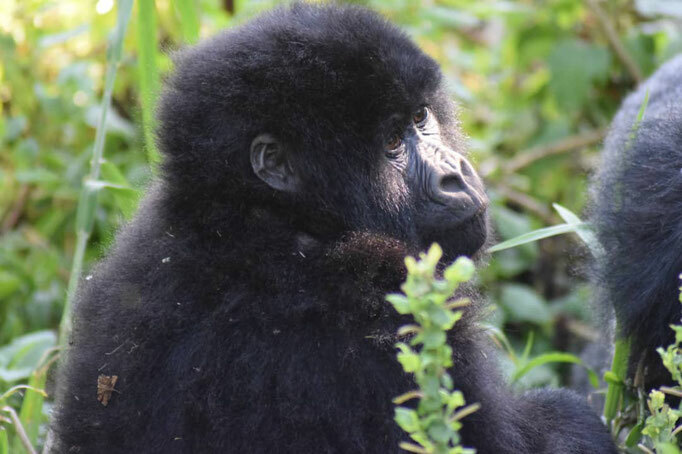 Though Bwindi has more gorillas and is a recognized as UNESCO world heritage site, Mgahinga is also a great park worth considering for a gorilla safari. We now know that the Nyakagezi gorilla family in Mgahinga has more silverbacks than any other park and is one of the largest habituated gorilla groups. There are fewer crowds during the briefing/tracking and locating the gorillas is easier. Mgahinga is the only park in Uganda where one can spot the golden monkeys and do mountain climbing alongside gorilla trekking. The Batwa Trail in Mgahinga is a more fulfilling experience than the same visit in Bwindi.